Advertorials: Nike, Nike, Read All About It! Nike, Nike, Read All About It! 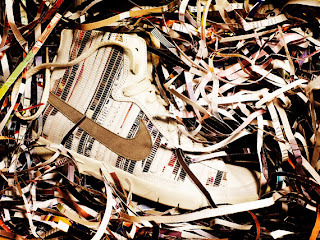 2011 will not only bring a new year to our calendars, it will also bring a new collection of shoes from Nike. In one of the most dramatic green efforts in the shoe industry, Nike is set to launch the Premium Print Pack for women. The shoes in this line are actually made from recycled magazines, which are shredded and then reconstituted into ... you got it, shoes! Three different designs will be launched under the Sail name: Khaki, Sport Red, and Birch. Each is a one-of-a-kind design and is pretreated with a clear solution to make the shoes durable and long-lasting. As if this concept isn't enticing enough, Nike is offering this as a limited edition shoe line in just a few countries across the world. No doubt, controlling the supply of shoes will help to entice the demand. I love this concept, as well as the look of the shoes. Nike has done a terrific job of illustrating their environmental efforts, while luring consumers in with a positively charming new shoe.